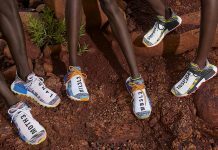 Pharrell once again straddles the line of having the public adore him and hate him, this time with a sappy “Dear Baes” collab with adidas Originals Women’s. We love the guy, but he needs to ditch the “Happy” steeze and freshen things up a bit. Name aside, the collection is killer. The vibe-tastic workout/streetwear steeze is certainly the best we’ve seen in a minute. 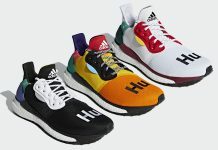 The vibrant offerings are things we’d love to see women in and hopefully for Pharrell and adidas Originals something women will want to be seen in. Polka dots and vague floral graphics add dynamics, all the while modeled by some bae-quality models. 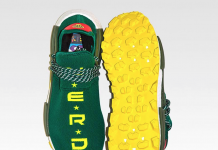 The threads should be hitting shelves today if sources are correct, so head to your adidas OG plug and nab yourself (or your girl, bro) something from the line now.